Several weeks later, Sophie travels to the Isle of Skye to stay with her uncle and cousins at their isolated island home, while her parents go travelling abroad. With a dark cloud already hanging over her due to recent events, she is uncomfortably aware of just how strange her family is, and just how creepy their home- a converted old schoolhouse that was formerly called Dunvegan School for Girls- truly is. Her uncle, a painter, mostly keeps to himself in his studio, painting striking landscapes of the island and ocean, and including the occasional fantastical element like a mermaid that looks remarkably like his eldest daughter Piper. Piper, close in age to Sophie, seems almost too good to be true. She’s beautiful and helpful, and immediately wants to become friends with Sophie. Her other cousins- Cameron and Lilias- are less welcoming. Cameron, a talented pianist, has a scarred, burnt hand from a long-ago accident and his brooding manner suggests that he would rather Sophie leave the island and go home. Similarly, Lilias, a seven-year-old girl who has a phobia of bones and a fascination with grisly stories, tells Sophie that her deceased sister Rebecca is roaming the halls of the house, despite her having died before Lilias was even born. As if this fact isn’t creepy enough, Sophie, on exploring the old schoolhouse, discovers that several girls (while attending the school in the early 1900s), were maimed or died in the house, and that their collections of Frozen Charlotte dolls still reside in Rebecca’s bedroom. These creepy little porcelain dolls are based on old American folklore about a vain girl named Charlotte who chose to freeze to death while travelling to a ball, rather than cover up, just so that other people could see the finery she was wearing. Lilias is convinced that the dolls come alive at night, making her do horrible things and wanting to kill her if she refuses. Sophie, on seeing their creepy little faces, can’t help but believe her, especially when she notices strange things happening in their vicinity, but she doesn’t know how it could be possible. As time goes on, and more and more secrets about the house and Rebecca are revealed, Sophie realises that she and her cousins are in grave danger. But how can she make people believe in something that she barely believes herself? 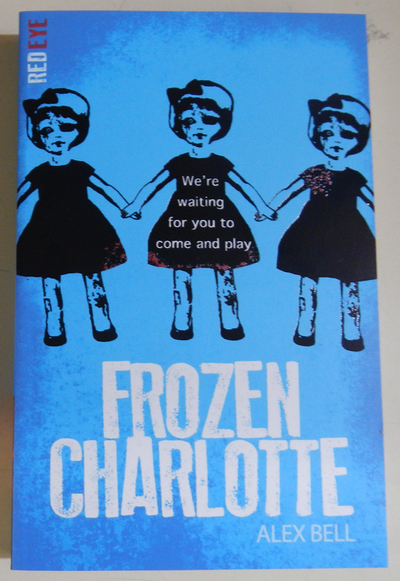 How can the stories of the Frozen Charlotte dolls really be true? And how will she save them all when the dolls are let out of their locked display cabinet and the horror really begins? This is a sufficiently creepy story aimed at teen readers, holding all the hallmarks of a horror film. Sophie is a believable protagonist, who casts aside her logical doubts about the Frozen Charlotte stories when faced with the evidence of their horrors. This adds credibility to the storyline, making it even creepier for readers. The build-up of the story, with the occasional jarring moment, is also very similar to the set-up of your typical horror film, which helps to maintain interest for readers who have a shorter attention span, encouraging them to continue and find out what happens next. Each chapter starts with at least four lines from the old folk ballad ‘Fair Charlotte’ (which the stories and dolls are based on), and with flashbacks to the past and Sophie’s current encounters with the dolls, the author is able to weave a disturbing and eerie storyline, which culminates in a slightly unexpected finish, and the opening for a potential sequel (a prequel is already on its way). This book is not for younger readers, who might find some of the content unsettling, but if you are looking for a genuinely unnerving novel and appreciate atmospheric horror stories and tales, then this could be the book for you.